A couple of months ago I was asked to tender for a job photographing views of and from the routes of a number of public footpaths in the Machynlleth area. As part of the Dyfi Biosphere project the paths are being cleared, waymarked, and promoted as circular routes – with a series of leaflets being produced to assist walkers. The photographs are for the leaflets. My first problem was that the client required “joint copyright” with me. I had an idea this was meaningless, and on investigation it turned out that joint copyright can only exist if there are joint creators. Both creators would be required to give permission for the use of an “artwork” outside any original agreement. So this was clearly not the case. After a series of phone calls and emails it became clear that the client required use of the images on a long-term basis within the organisation, and no more. So they didn’t need copyright at all! Just a licence to use the images as and when required. Then pricing. I had a fairly good idea who the other photographers might be so I knew that I would have to price myself low to counter their bids. I imagined I could walk each path once and take photographs on the walk. Add on travel expenses, a nominal amount for subsistence and Bob’s your uncle! I got the job. I started work on the first day of the hot spell which lasted for three weeks in July. It immediately became apparent that cloudless skies were quite unsuited to landscape photography, but I knew that anyway. More to the point, there was no way that I could produce decent work on one walk around the route. The first visit would only serve as a recce for a later visit (or visits) once I knew where the views were and what time of day would give best results. It was a silly and foolish mistake to make, and I’m surely regretting it now. My best estimate is that the job will probably take twice as long as I had allowed for, and the travelling expenses will probably be double too. Day rates had, I believed, plummeted in recent years along with all other sources of income for photographers. The price I quoted was less than that I charged about fifteen years ago when I did a lot of work for the Wales Tourist Board. It did not take into account the half a lifetime of experience I now have in landscape photography, and the quality of the images that I produce. But I believed that I would need to price myself low to get the work. The particularly frustrating thing is that no-one else had actually tendered. I was competing only against myself. Well, such is life. There have been a few decent half-days since the end of July so I’m making some slow progress. Several of the routes are in the Corris area which, given its long history of slate mining, is a fascinating place to take photographs. 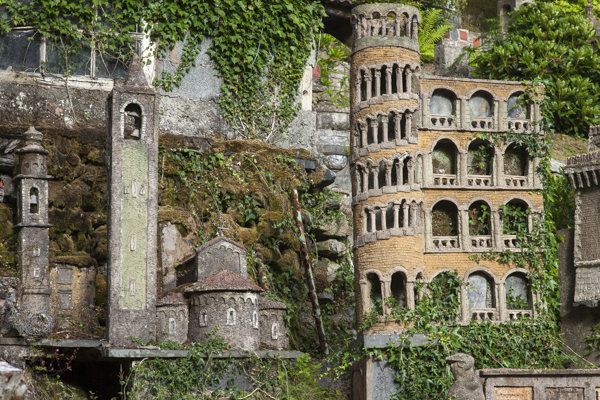 Undoubtedly the most extraordinary place I have found is a private garden clinging to hillside which is crammed with scale models of Italian palaces, cathedrals and monuments. Not at all what one expects to find in a damp and claustrophobic Welsh mountain village! This entry was posted in Uncategorized and tagged competitive tendering, copyright, corris, dyfi biosphere. Bookmark the permalink.